When we say the phrase “side effects,” what do we think of? There’s a new risk in town in health care, and it’s the equivalent of an upset stomach when it comes to a co-pay for a branded on-formulary drug, or liver damage if it involves a coinsurance percent of “retail” price for a cancer drug, potentially running into tens of thousands of dollars. Full Disclosure — Out-of-Pocket Costs as Side Effects, a Perspective article written by a team from Duke University’s Fuqua School of Business, published in The New England Journal of Medicine’s October 17, 2013 issue. While doctors usually disclose potential side effects with patients when they’re about to undergo a procedure or take prescribed medications, health providers rarely talk through financial implications with patients – who are morphing into health consumers, paying greater shares of out-of-pocket costs. These costs now rival line items in peoples’ household budgets competing for wallet space with housing, food, transportation, and energy costs. Including the subject of costs in the physician-patient discourse could reduce costs for patients and the community in the long term. The team used data from the National Center for Health Statistics’ 2011 National Health Interview Survey, published by the Centers for Disease Control and Prevention (CDC). Health Populi’s Hot Points: When people “manage” out-of-pocket health care costs, they often forego, postpone, or avoid necessary treatment in the short run — making a short term seemingly rational “fiscal” decision – which can lead to a devastating bad “physical” outcome. For example, delaying a mammogram can lead to a woman moving from Stage 1 breast cancer to Stage 3, a far more challenging prognosis. Or, foregoing filling a prescription for a high blood pressure medication can lead to a person’s worsening heart health. 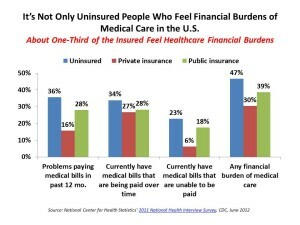 In both cases, consumer-patients find themselves with an exacerbated health challenge and greater health care cost burden. Shared-decision making between patients and their health providers is a relevant and useful strategy for providers to adopt in the growing value-based and accountable care regime for payment. As doctors and hospitals accept more financial risk for population health — that is, patient outcomes — patients themselves must play a greater role in self-care and become more effective co-creators of health. Even that “platinum standard of care,” mentioned above, won’t yield an optimal outcome unless the patient-person (and when appropriate, her caregiver) correctly utilizes the resource – say, taking a medication on-time, or regularly measuring and recording blood glucose. But underneath this all, the high-cost medical culture of overtreatment, and lack of transparency of health costs, must be addressed to solve this challenge. Growing websites and online health marketplaces that more health consumers use may help drive costs down and, eventually, quality over time. Employers who sponsor health plans should better educate and empower enrolled workers on how to best use their plans (increasingly, high-deductible plans where literacy is currently low).